The Ecoteck Silvia is unique in the Ecoteck pellet stove range in that it is a pedestal type stove, although in a modern style. Made of fabricated steel, the front of the Silvia has an aluminised finish and a large viewing window, making it suitable for homes with a contemporary design. Producing 48,000 btu. and able to heat up to 2,000 square feet, the Silvia is the second most powerful stove in the Ecoteck range, along with the Elena, and includes a humidifier tray to which natural oils and essences can be added. The Silvia has a very low particle emission rate of 1.65 grams per hour and operates at an overall efficiency of more than 81%. Remote control, GPRS text message control and a wall thermostat are available as options. Heating Area 2000 sq. ft.
Max. Heat Output 48,000 btu. The Firex 600 combustion chamber is ceramic and vulnerable to breakage through careless handling, strong detergents and abrasive cleaning products. 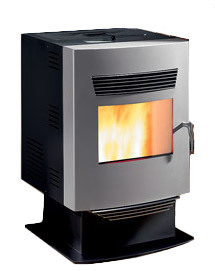 If you would like to leave a review of the Ecoteck Silvia pellet stove, please use the form on the contact page.